Hope everyone is enjoying the weekend. The weather was nice this morning so the family and I took a trip down to the Saturday Market and walked through the Farmer’s Market to see what fresh and local produce was available. I happened to find some beautiful organic rainbow chard. The green leaves where huge and had great color. I love to steam them and eat them with a bit of apple cider vinegar. This is what I ate for lunch along with some fish head stew my wife cooked up. I’m glad that the Farmer’s Market is getting into full swing. I recently watched Food Inc. which describes our industrialized food system not only in terms of our health, but also in terms of how it affects the environment, the economy and the way we treat not only animals but our own workers. If you haven’t seen the movie I would recommend it. Buy organic fruit and vegetables that are local (in season). 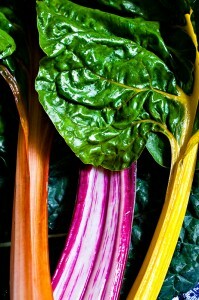 Look how good that rainbow chard looks! We will try harder to avoid purchasing products that contain HFCS (High Fructose Corn Syrup). We already found Blue Sky soda which is made with cane sugar. They even have organic soda. To me it tastes better than Coke or Pepsi. We don’t drink a lot of soda but when we do we purchase Blue Sky. Why buy local organic produce? When you purchase your food locally you are lessening your impact on the environment because the food is sustainably grown near you and doesn’t need to be harvested early and then transported sometimes thousands of miles to you. Because local food is harvested at the peak of ripeness it tastes better. You are also supporting a local business instead of a multi-national corporation. By purchasing organic you are also not ingesting into your body pesticide residues. Pesticides have been shown to be associated with some cancers, autism and neurological disorders. Sure choosing organic may cost a bit more but ask yourself what your health and environment are worth to you. The same goes for buying locally raised, grass fed, free range meat. Our current factory meat facilities treat animals inhumanely, pollute surrounding communities and are unsafe to our food system. Yes, local meat is more expensive when you strictly compare the price on the sticker. But if you compare the environmental, health and worker cost you will quickly see that factory meat is heavily subsidized which is why we perceive it to be cheaper at the store. It’s not when you look at the whole picture and the repercussions of factory farming. How many products in your kitchen right now contain HFCS? I bet quite a few. As we started looking we found it so many of the bottled and processed foods we eat. HFCS is a highly refined clear liquid derived from corn starch. Food manufactures love to use it because of its long shelf life an it’s relative low cost. It’s thought to be a major contributor to our obesity problem. For us we will be checking the labels more carefully to see what is inside of the things we buy. If we see HFCS we will see if we can’t substitute with a product that doesn’t contain HFCS. But really it comes down to choice. We have the opportunity to make a choice about how we value our health and environment three times a day by choosing what we eat. What’s it worth to you?